This was when Arielle and I began to dream of owning our own agency with more flexible hours and no brick and mortar location—a website design, development, and branding agency run entirely digital. From this, Current 120 was born. In the two years since we’ve started our business, we’ve learned a great deal about working remote. We’ve dealt with misconceptions, overcome location obstacles, and built an agency we love. Today, we want to share with you the good, the bad, and the beauty of working remote. I want to start by saying that working remotely is not for everyone and that’s completely okay. Everyone has a style—and environment—in which they work best. I’m lucky that mine happens to be at home, at my desk, with my cat lying next to me. While there are other distractions or temptations (dirty dishes, a cute cat, Netflix), it’s important to have or develop a strong sense of discipline when working remotely or from home. Creating a dedicated workspace (wherever your location may be), like a desk or office area, is a great way to cut out distractions and determine a place for work, rather than leisure. In my second paragraph, I mentioned that in starting an agency, Arielle and I wanted more flexible hours. I feel so naïve now thinking that meant our hours would be shorter! When you work from home (or remote) you have everything you need at your fingertips…all the time. My phone beeps when I receive an email, Slack message, or Google Voice call. When I’m relaxing in the evening with my husband, my computer is nearby in case a client needs something. It’s hard to disconnect whether that be at home, or while traveling (case in point, I am writing this blog post while on vacation). For me, the biggest downfall of running a business abroad is missing seeing our clients’ beautiful faces in-person! Though, video calling is a great solution for the interim. I look forward to the day I can join Arielle in-person for meetings! I feel like time zones should have a quick shout out for making things a bit more complicated, but we’ve learned to just roll with this one—midnight meetings and all! Working remote provides a great opportunity to travel, move around often, and work independently while remaining employed. These perks have allowed me to create and build a business while joining my husband on a trip of a lifetime, living abroad. An opportunity like this wasn’t available pre-internet, so I feel very fortunate to be living in the post-dialup word. I mentioned above that I was writing this on vacation, but that point doesn’t only belong under that bad. 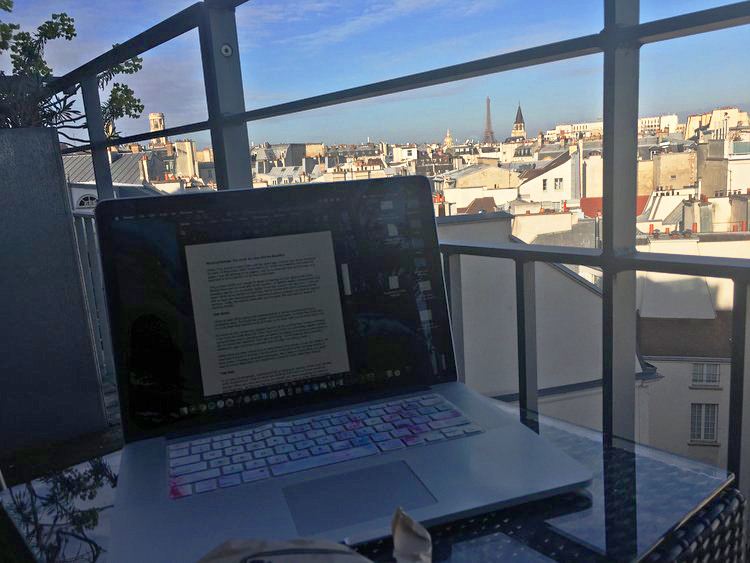 How can I possibly complain that I have a job (and a wonderful business partner) that allows me to write blog posts while staring at the Eiffel Tower?! If this sounds like a good fit for you, then get out there and make it work! Exploring, seeing the world, and meeting people from different cultures only makes your work better! Everywhere I go, I see advertisements in the subway, visit websites of restaurants I want to visit, and draw inspiration from the people and the ways they talk. Working remote provides wonderful opportunities and I would recommend it to anyone with focus, discipline, and wanderlust!